Choose to Reuse Member Nina Miller tells the Environmental Protection Commission about some common misconceptions of the proposed bag ban ordinance at its meeting on Wednesday, Aug. 1, 2012. Darien, Conn. The Environmental Protection Commission had its first public introduction to the proposed plastic bag ban ordinance Aug. 1. 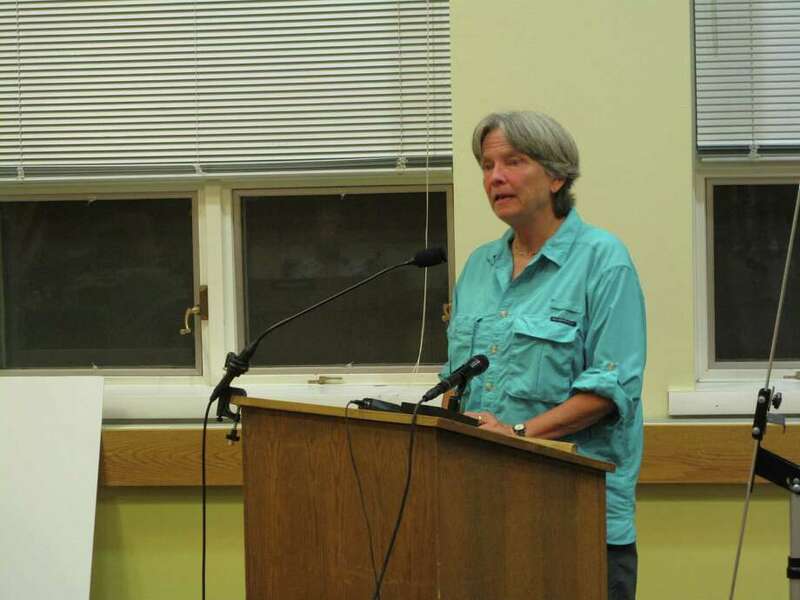 The commission was recommended to handle enforcement of the proposed ordinance by First Selectman Jayme Stevenson in June. One week later, the Town Government, Structure and Administration Committee of the Representative Town Meeting amended the proposed document to reflect her recommendation. Several members of Choose to Reuse in Darien, an advocacy group for reusable bags that also supports the ordinance, attended the meeting. Commissioner Vickie Riccardo asked if they knew when the ordinance would go before the RTM. RTM Member Deepika Saksena, District 1, said, "There's a good chance it will happen on Sept. 24 because that's the last meeting of the RTM, and subsequent to that will be the new RTM." Saksena also noted TGS&A meets Sept. 11. "They have to approve the ordinance before it goes to the general meeting," Saksena said. TGS&A already approved several amendments to the ordinance draft in its June meeting. But due to time constraints, members were unable to vote to approve the document in its entirety. The EPC didn't accomplish everything on its agenda either because several commissioners, including Chairman Michael Tone, were absent. Yet, Choose to Reuse Member Nina Miller discussed some of the misconceptions she has heard about banning plastic bags in Darien. Miller said there would be a six- or nine-month period should the RTM pass the ordinance "to give retailers a chance to use up their plastic bags." She also said complaints are consumer-driven. "In other words, there is no one in Westport or Rye or South Hampton or any of the other places along the East Coast and West Coast and central U.S. that patrols the source," she said, adding, "All you need is a telephone number for a consumer to call in and say, `So and so is still using plastic bags,' and someone can go out and explain to them the situation." Miller said she has volunteered to be that point person if it is legal. The EPC had no further discussion on the topic but will likely discuss it at its next meeting Sept. 5, before TGS&A and the RTM meet later in the month.